Summary: If you plant carrot, tomato, and cabbage seeds, Bunny and Mouse discover, you get carrots, tomatoes, and cabbage. They’re just about to enjoy the fruits of their labor when a flock of birds shows up, clearly wanting to sample the veggies. If you plant the seeds of selfishness, they grow, too…into a heap of trouble. And, in this case, a food fight. 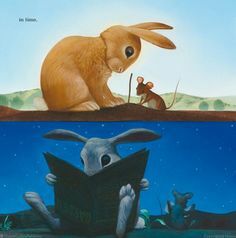 Ready for a different approach, Bunny and Mouse try sharing, planting seeds of kindness. The birds reciprocate by flying overhead, dumping bags of seeds. The resultant garden makes everybody happy. 32 pages; ages 4-8. Pros: The big, beautiful pictures of really, really cute animals complement the simple text and message. Cons: The message may be a bit heavy-handed. He’s one of my favorite illustrators.